We were a family of five, three boys and two girls, one boy having died in infancy. My Dad’s name was David Lorenzo Ballard. I never saw his parents as they passed on before I was born. However, recent and thorough research shows the first Ballards came from Old Normandy in northern France. It was so called because it was first settled by the Norsemen of Denmark. They went to Kent, England, riding in the company of William the Conqueror. At that time it was spelt de Ballord, but has been spelled Ballard for some five hundred years. From here some of the Ballards came to Jamestown, Virginia. I did, however, remember my mother’s parents well as they came often in winter to visit us in our lovely home in North Dakota near a little town of Plaza about fifty miles from Minot, North Dakota. My grandfather [John Fitz Gibbons] was a very religious man with a keen sense of Irish wit that went with the name Fitz-Gibbons. He’d love to sit in our lovely living room with its big south window with stained glass top panes. He’d pull his rocking chair up to the coal heater with its nickel trim and mica windows and rest his feet on some of the nickel just below the damper. Invariably the flames would go higher and brighter in the mica windows as grandfather’s toe accidentally pushed in the damper. I tell you, those North Dakota winters were cold. But the drought came and I’d see my dad every evening sitting on the big stone step looking for the rain that never came. Even our trees died. So in 1918 my oldest brother Claude, with his wife Cecil and infant son Leon, migrated with Cecil’s family, the Fred King’s, to Canada. 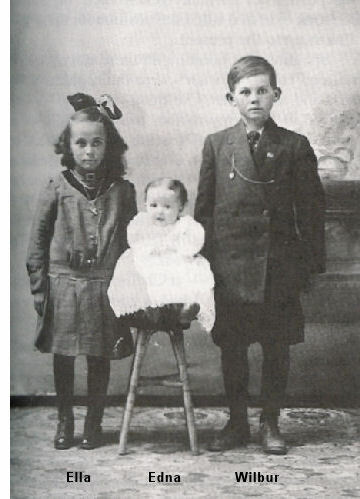 In 1919 they came back for Christmas with us and in the spring of 1920 my parents decided to leave the drought-stricken country and join Claude in Saskatchewan. In March they loaded two box cars, one of livestock and one of machinery, and Claude and my youngest brother Wilbur started for Claude’s home. They had to unload the stock for inspection at Portal and while there a storm came up and it was four days before they could go on -- there were drifts as high as the boxcars. They watered the stock by chopping holes on a nearby waterhole. My second brother, Floyd also came to Canada at this time. He homesteaded and eventually bought land, married and lived here until he moved to Creston, B.C. after his family had grown. In May of that year, my dad, mother, older sister [Ella] and I followed them in a covered wagon. There were two beds at the back and a three burner oil stove with oven to bake bread, a makeshift cupboard and trunks of clothing and bedding. At the front, on a spring seat (wagon equipment) sat my parents driving the horses. Tied behind were two more, a sort of spare tire deal! At night they’d unharness the team, untie the other two and hobble them to graze for their supper, supplemented with a bit of oats. It was a lark for me, that trip, young as I was, every day a new adventure, every night a new camping ground. I realize now how torn my parents must have been, leaving behind a lovely home, friends and relatives. Never by word or even look did they let my sister and I know their apprehension. We arrived in June at my brother Claude’s home, which was land rented from Ivor Knutson about three miles west and a bit north of the present village of Spalding. That summer we lived in our covered wagon and a granary of Claude’s. In the fall my dad rented land from Tom Shindler of Watson where we lived until 1931 when the house burned shortly after my dad died. It was a cold, cold partly log, two storey house. Our lovely big heater had been left behind and in its place we had an air-tight – your front scorched and your back froze when you came down to dress by it on the winter mornings. My sister and I started to school that year at Old Spalding, about a mile walk. Our first teacher was a Mr. Nichelson. I was terrified of him, I remember. I had gone to school only two months in the States and was in Grade 2. One day, I remember, he stood me outside for punishment. Along came Ed Brenna, who lived and had a blacksmith shop just behind the school. He asked me why I was there and when I told him, he took my little hand in his big blacksmith one, marched me up to the teacher’s desk and said, “It’s much too cold for this child outside and I never want to see her there again”. And believe me, he never did. Our next teacher was a lovely English lady, a Mrs. Brown, who later married Walter Paddle and moved to B.C. Then came Daisy Reed, a pretty and very sweet girl. She called in once in the last years we had the store and asked for my sister who must have impressed her. She was living at Sturgis, but her husband has written me that she has since passed on. Following her was Mr. Lyngseth and when he left to further his education, the students very reluctantly saw him go. He was followed by an Ernest Magnason. My sister went to Naicam to school about this time as the higher grades were not taught here. Soon after, I went to what is the present village of Spalding as the former townsite moved when the railroad went through. Mr Lynseth returned to teach then. When I finished my Grade ten here, I too, went to Naicam as there were no higher grades taught at Spalding. There was no church to which my parents belonged, so my sister and I went to the United Church Sunday School and Church in Spalding Village. Speaking of the railroad going through, it went directly behind the big barn on our rented farm. Many mornings during the depression we’d find men who had been ‘riding the rails’ sleeping in the loft, and to many, many my mother gave a meal. I often wondered if they didn’t leave a sign that here was a good place for a meal. She was often alone but only once do I remember her saying she was a bit frightened when one ordered her to get him food, but the poor man had probably been without food for days. The depression sat rather lighter on us than on many because my mother worked as mid-wife with Dr. Stuart, and later we sold milk and cream to Naicam. This extra bit made it possible for my sister and brother to have piano lessons. She did well, while he went on and took his A.T.C.M. and taught piano lessons for a number of years himself. When the Shindler house burned, we moved to a partly finished house on land we’d bought, now owned by Gordon Nystuen but better known as the Bakstad place, about a mile and quarter north of Spalding. Here we lived until 1935 a year after I married, when my mother, Wilbur, my husband and I all moved into Spalding Village.